The Desert Ridge community is located conveniently north of where the 51 intersects the Loop 101 freeway in North Phoenix. It is home to one of Arizona's largest master-planned communities and comprises over 5,700 acres and over 50,000 residents. 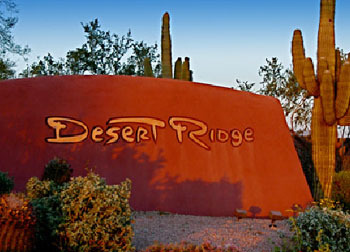 Desert Ridge offers everything from apartment-style living to luxury homes, and everything in-between. The Desert Ridge neighborhoods are comprised of beautiful developments like Aviano, Fireside, Toscana, Bella Monte, Cielo, La Verne, the new Sanctuary at Desert Ridge, and more. These neighborhood communities are located within minutes of the Desert Ridge Marketplace where you have access to over 1.2 million square feet of retail shopping space featuring outdoor fireplaces and unique water features. Just east of Desert Ridge Marketplace is CityNorth, where you will find even more upscale shopping and dining to suit every need. For those that are into exploring the outdoors, the Desert Ridge area offers numerous biking/hiking trails throughout the community as well as multiple parks strategically placed throughout the community. Aviano also boasts an incredible recreation center. In addition, there are 10+ golf courses within a 10 minute drive of Desert Ridge. The Desert Ridge community is also close to many upscale resorts, including both the JW Marriot Resort and the Westin Kierland Resort, perfect for both "staycations" and out-of-town visitors. The Desert Ridge area is also part of the coveted Paradise Valley School System, which is known as one of the top school districts in Arizona. Buying or selling a home in Phoenix Desert Ridge neighborhood? We have the complete MLS inventory of Desert Ridge homes for sale. Sign up for new listing alerts and be the first to see the latest Desert Ridge homes as soon as the hit the market.